Quietyme has been a solution for the health care and hospitality industry aiming to keep noise levels down and living conditions as high-quality as possible. The Wisconsin-based company has recently branched out to offer the same type of control system for property managers and landlords to help keep their tenants happy. The original idea for Quietyme emerged when founder John Bialk was working as a property manager. Dealing with noise complaints, he said, was one of the most common issues that oftentimes would lead to feuds between neighbors. Feeling that much of his time was spent managing complaints instead of managing the property, Bialk decided to develop a noise-monitoring system. The system sets off an alert via a text message or email when a tenant’s dog is barking all day long or a neighbor has friends over late listening to music. Quietyme doesn’t intrude on privacy at all, which Bialk said is often an initial tenant concern. It measures noise purely based on decibels and has no capabilities to listen in on a conversation, he said. The goal is to solve problems before they even begin. The system works to monitor noise levels via a wireless network, in addition to monitoring humidity levels, light and temperature. For $3 per month, per unit, property managers can cover roughly 200 units. One main hub can be connected with add-on wireless sensors throughout the property that can keep track of all rooms in a building. The information gathered is then used to alert and report problems or damages through a smartphone application. Property managers can analyze data by logging in to an online account. Additionally, tenants can sign up to receive immediate alerts when the decibel level has reached a certain level so they can avoid any confrontation at all. 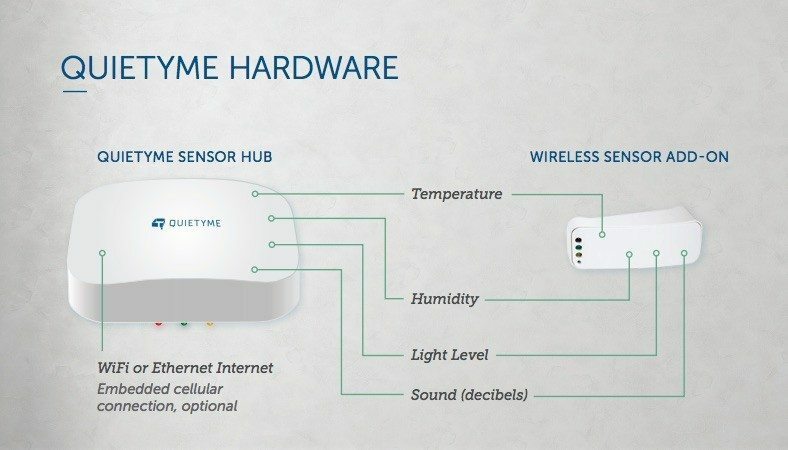 Quietyme can also monitor mold and mildew based on humidity levels as well as potential water damage, the risk of freezing pipes, and carbon monoxide and smoke alarms throughout a property. Landlords are also able to monitor movement and activity in vacant units. The company is also doing a partnership with American Family Insurance, as the product is intended to keep tabs on potentially damaging temperature shifts and water leaks. In what could save the insurance industry money, the partnership has a big interest in keeping costs down for renters and landlords.